We began the day with the usual routine: breakfast on the second floor with Baoli. The only unusual thing about breakfast was that Tom wasn’t with us, so we weren’t able to enjoy his idle prattle. Following breakfast, we headed to school. 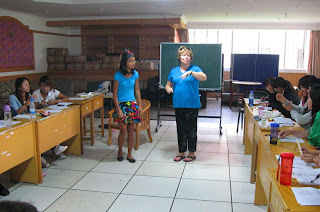 Today, Nora and Geni’s class performed skits from old fairy tale books and learned about American currency. 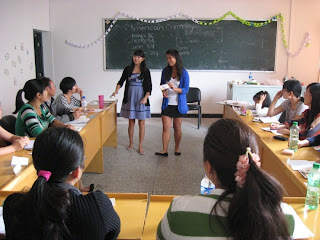 Dia and Fran’s class had a heated debate about gender roles and also practiced their songs for the closing ceremony. Tom’s class read newspaper articles, practiced pronunciation, and sang songs. After class, each of the three classes took their teachers to lunch. Nora and Geni went to a restaurant that served several dishes, including fish, duck, chicken, soup, and rice. Dia and Fran went to a restaurant that served mostly spicy food, and Tom went to lunch with his class and ate very exotic food. Dinner was fabulous, as always. When dinner was over, the Gualtieris returned back to their rooms for a peaceful evening. "The end of one day is the beginning of another." Team 203 started the day with a nourishing, healthy breakfast at the Golden Spring Hotel. Lots of coffee for Fran and everyone but Baoli, late as usual. Off to teach class at 8:00 am as usual today. Tom's class read and discussed newspaper articles today. They also worked on tongue twisters and played pronunciation games. Geni and Nora's class read stories from children's books and acted the plots out after discussing the meanings. There were some real actors and hams in the class. Their day was completed with games and songs. Dia and Fran's class wrote and read compositions that started with a phrase given to them by Fran. The class was very creative and these resulted in a number of new vocabulary words. The class then worked on new songs and games which were brought to the class by the teachers from their personal experience. 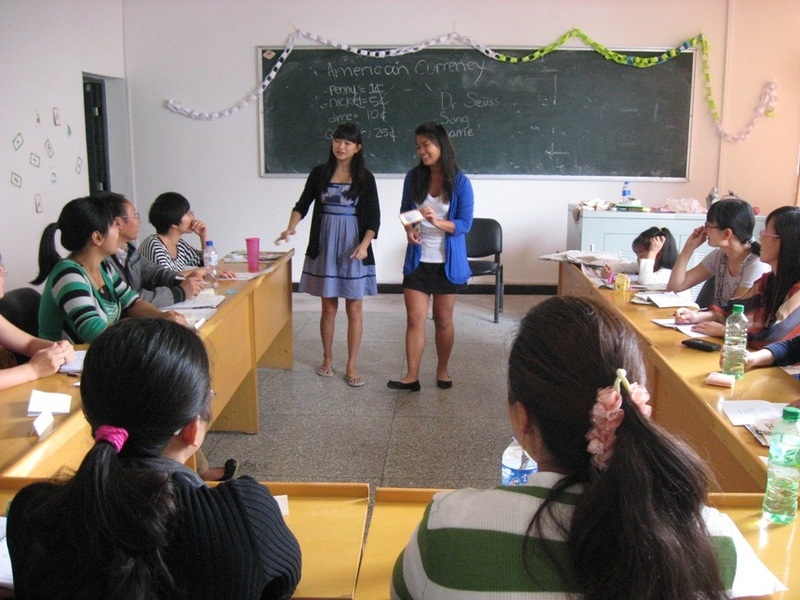 Afternoon classes were given in lecture form to the three individual classes. Tom discussed learning disabilities with each class for 40 min and then took individual questions. Geni and Nora discussed life of the American middle school student, high school student and details on university admission and life. They followed up each class with songs and chants. Fran discussed her personal Chinese adoption process for her three daughters and her personal experience owning and operating a small restaurant business. Everyone went back to the hotel tired but satisfied from a long day. The girls went shopping and Tom and Fran rested till dinner. Another fine dinner was had at the hotel and everyone retired early to work on Thursday lesson plans.